Just 19 members turned up to its launch event in the city of Wiesbaden last month, but the development has unsettled many in Germany’s Jewish community. According to police statistics, anti-Semitic attacks are on the rise in Germany. One incident caught on camera late last year shows a German man shouting abuse at the owner of Feinberg’s, a well-known Jewish restaurant in the Berlin borough of Charlottenburg. The man rants “what do you want here? You belong in the gas chambers. Nobody wants you here with your stupid Jewish restaurants,” until a police officer shows up. Mike Samuel Delberg, a restaurant regular and friend of the owner, posted the footage online to show others what he says he and other Jews have to put up with. Anti-Jewish aggression like this has become more brazen since the rise of the AfD, he says, so the very idea that fellow Jewish citizens would vote for the party is baffling. Delberg is vice president of the Jewish Students Union of Germany, which recently organized a demonstration against the group Jews in the AfD. He warns that the AfD is exploiting what he sees as token Jewish members. Wolfgang Fuhl, 58, was an AfD candidate in Baden-Württemberg, a state in southwest Germany, in last year’s federal election. He is Jewish and a founding member of Jews in the AfD. He scoffs at the idea of being used by his own party. Police figures show that more than 90 percent of anti-Semitic hate crimes in Germany last year were committed by members of the far right. But Germany’s anti-Semitism commissioner, Felix Klein, says the figures don’t include incidents that weren’t reported as other types of crimes. Delberg says he understands Fuhl’s fear of anti-Jewish hatred from parts of Germany’s much larger Muslim population. But “choosing a party that is racist won’t solve the problem,” he says. Delberg adds that anti-Semitism is deeply rooted in the middle of German society among people of all faiths. 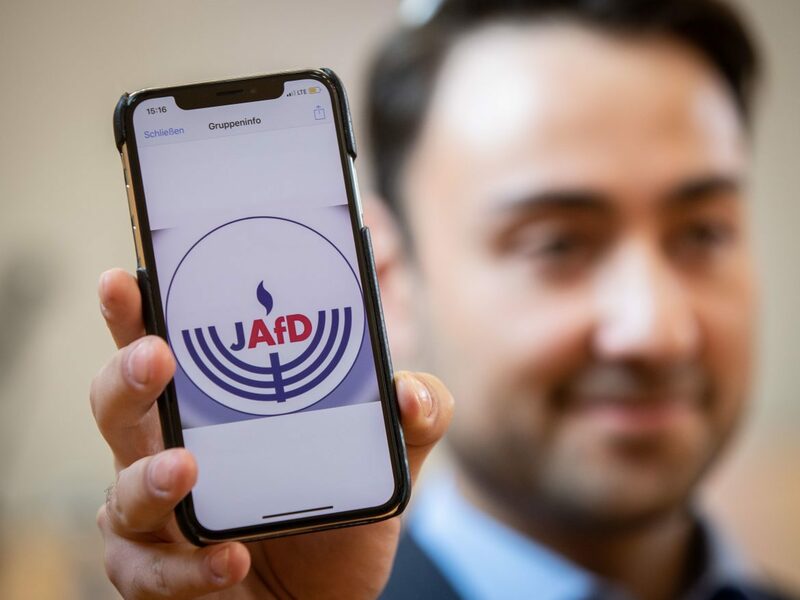 Fuhl says a wide variety of issues motivate Jewish citizens to vote for the AfD and he believes it would be discriminatory to expect Jews to think and vote in any particular way. Fuhl claims the AfD has more Jewish members than any other party but is unable to give exact numbers because political parties don’t collect data on their members’ religious affiliation. He considers 19 members a good start and is optimistic more will join the association. Fuhl says the AfD is the only party willing to stand up to “imported anti-Semitism,” which, he says, has become an issue since the influx of mainly Muslim refugees in 2015. Melanie Amann, who reports on the AfD for the German magazine Der Spiegel, says that fear about reported anti-Jewish sentiment within the Muslim community may drive Jewish AfD membership. But she believes the party doesn’t care one way or another about Germany’s Jewish community. ”I believe that the organization Jews in the AfD is merely a tactical instrument to be used against the Islamic community in Germany,” Amann says. She argues that, despite Holocaust revisionist rhetoric from some members, the AfD is first and foremost an anti-Islam party. Back at Feinberg’s, Delberg sees the same parallels, but he doesn’t agree that the AfD is ambivalent about the Jewish community. Put simply, he adds, Jews in the AfD just aren’t kosher.